I recently came across the “An early Halloween for gold traders” article by Mark Hulbert. 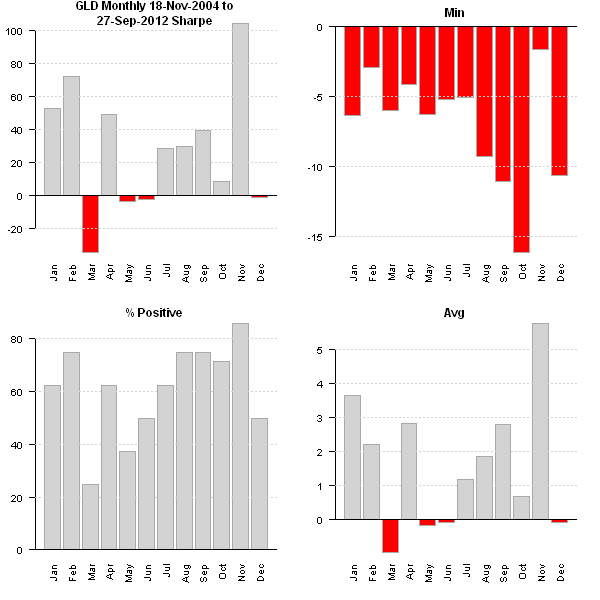 I have discussed this type of seasonality analysis in my presentation at R/Finance this year. It is very easy to run the seasonality analysis using the Systematic Investor Toolbox. This confirms that October have been historically bad for Gold, but we used only 8 years of history because GLD only started traded in 2004. To get a more complete picture, there is a long history of Gold prices at the Deutch Bank. I found this data source used at the Wikiposit. I created a helper function deutch.bank.data.gold() function in data.r at github to download prices from the Deutch Bank site. 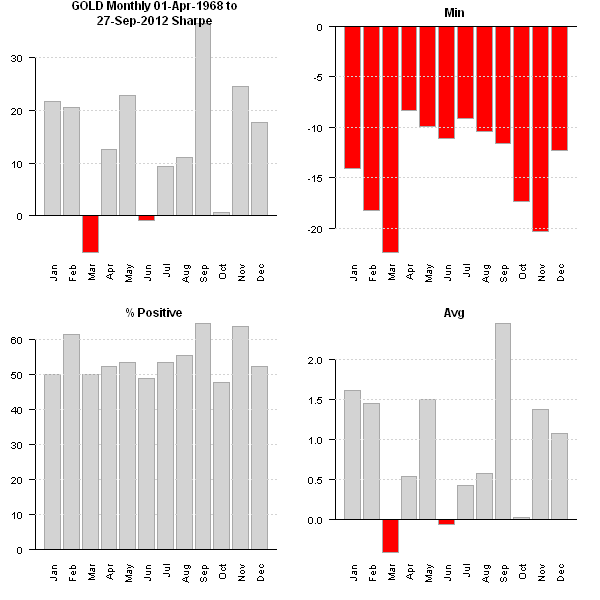 The October have been historically bad for Gold using longer time series as well. Next I would recommend looking at the daily Gold’s performance in October to get a better picture. You might want to use the Seasonality Tool for this purpose. Please read the Historical Seasonality Analysis: What company in DOW 30 is likely to do well in January? post for a case study on how to use the Seasonality Tool. To view the complete source code for this example, please have a look at the bt.october.gold.test() function in bt.test.r at github.